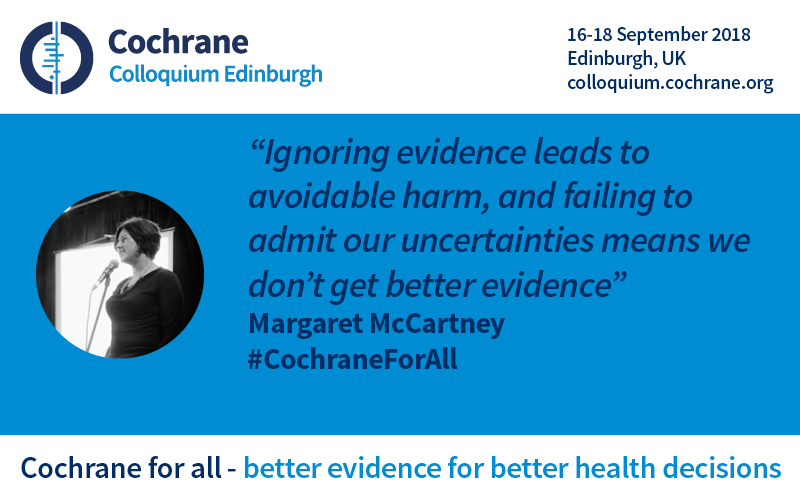 André Tomlin (@Mental_Elf), from the Beyond The Room team at the 2018 Cochrane Colloquium, #CochraneForAll, in Edinburgh interviews Dr Margaret McCartney (@mgtmccartney), general practitioner, about the practice of evidence-based medicine, relationships and trust. Hello everyone. Welcome back to Cochrane For All. I am here with Margaret McCartney, GP, who is giving a keynote tomorrow. Is it tomorrow? I am. Yes, it is tomorrow. Yes. We’re really looking forward to that. So you’re a GP based in Glasgow. What’s that like? It’s wonderful. It is, actually. So, I absolutely love my job. I work and live quite close to each other. And it’s just a joy and the best bit is knowing people over a long period of time. It is just so, so enriching and such good fun. And it sounds really soppy [laughs] but actually it’s lovely. It is just a lovely thing to look after people for a long time. And it makes it easier for me because…because things fit in, things make sense. You don’t have to pick up at the beginning, every time, with people. And it also makes it easier for me because if, on the many occasions when I am imperfect or not as good as I should be, people are willing to forgive things, I think, better because they see you in the whole, rather than on one stressed day, where you didn’t go into things in as much detail as you would like to or should have done. So, it makes it easier for me, I suppose, on two levels. But it’s very rewarding. I mean it is very hard work, I think. I work half time. I would struggle, I think, to work full time. It takes me more or less full time hours to do a half time job but it is a fantastic job and I would recommend it, but it is very hard work in very many different ways. Probably emotionally hard work, I would say, is the hardest bit of all. Hmm. And we’re here at the Cochrane Colloquium. This is the kind of, one of the key organizations in this country, in terms of evidence-based medicine. Do you think your practice is evidence-based? And what does that mean to you and your patients? Well [laughs], that’s kind of the killer question, isn’t it? Are you any good or not, is really what you’re asking. And that’s fine [laughs]. And the honest answer is, I think, probably sometimes, I think, and hopefully most of the time. Sometimes, evidence just doesn’t exist, so if you have a patient with three, four or five different conditions, and they’re on a lot of medication, well, where’s the evidence about what you should do for that or not? We talk about prolonged QT intervals and some drugs potentially causing that. How big is the risk of that? What kind of risk is that? What does that mean in basic terms even for what I’m prescribing or what I’m offering to the person beside me? So, I think a lot of the time there isn’t very good quality evidence and we’re dabbling around trying to make the most of what we have – the best of what we have in these circumstances. So, I think it’s very difficult a lot of the time. But my job is not to force people to do what evidence says is most likely to work. My job is to make rational offers to people of what their options could be and then it’s up to having a conversation to decide what the best fit for that person is, at that particular time, and so I think my job is there to offer the best available evidence and it’s up to the person, the patient, to decide what they would like to do with that. And that is often quite difficult, particularly when the information isn’t very clear and isn’t very certain and there’s lots of gaps in the evidence as well. General practice is messy by default, you know. And people don’t tend to come in with one problem; they tend to come in with often three or four things that they want to discuss or to clarify or to ask questions about. And a lot of the time, I will have to go away and look up things. I’ll have to look up things as I’m sitting, you know. 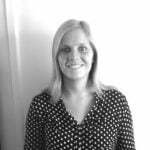 When I started in general practice, it seemed like a mark of shame to look something up. That seemed to be something terrible to do. But now, I don’t know how I would manage without it. I’m on the computer a lot to try and answer queries or to try and direct myself and the patient towards the best available resource to look up uncertainties, for example. So, I think, I’m not as evidence-based as I would like to be. I suppose, I could put it like that. OK, yeah, absolutely. And I think if you talk to the public about evidence-based medicine and clinicians using the search to inform their practice, most people just say, “Yeah well, doesn’t that already happen, you know?”. And that’s what people used to say, like thirty years ago when I first started working in EBM (evidence-based medicine), training health professionals. And the patients said, “Well presumably, they already do that don’t they?”. You know, it’s not recognized as a big gap between the research and the practice. Do you think in the last kind of twenty or thirty years, that gap has closed? Do you think EBM has had an impact, in that sense? I certainly think EBM has had an impact, in that it’s now socially unacceptable… it’s a bit like drink driving. It’s no longer socially acceptable to drink drive. Well, it’s no longer medically acceptable to do things without evidence or to pretend that you are. So I think, I think that has happened. It’s only credible to be practising with evidence. But I suppose there are big problems with the evidence, you know: so many trials don’t get published; so many trials are not asking the questions that are important to patients; so many trials the participants in them don’t represent the people who we’re meant to be offering stuff to. Guidelines that are meant to be based on evidence aren’t always reflecting the kind of quantity of problems or the types of problems that the patients that I’m looking after have, like the polypharmacy that we’re prescribing. So, I think, yes and also, no. Yeah. And I guess, one of the key, kind of, thoughts I have about evidence and clinicians from a kind of public perspective, is that, you know, most practices are not evidence-based in the UK. I work in mental health and there’s been a lot of studies that look at how evidence-based mental health practice is and we have some good evidence in some areas, but getting it into practice, implementing that is a real problem. So, given that evidence, given that medicine isn’t evidence-based, or as evidence-based as it could be, are we right to be trusting our doctors, our health professionals? Hmm, well [laughs]. It depends what you’re trusting your doctors and health professionals with. So, it may be you can’t do something that’s evidence-based because the resource isn’t there to do it or it’s not been implemented. Even stuff like cognitive therapy, you could say it’s meant to be evidence-based. Well the original trials, they were like twelve one-hour sessions with a clinical psychologist, I think I’m right in saying, that’s been diluted out now to something that’s not quite the same as was being offered in trials and the reasons for that are multiple: they’re to do with resources; they’re to do with what can be managed; what capacity services have; what staff they’ve got that are trained. And I kind of understand that. I think honesty is imperative, you know. And I have certainly done a lot of things that I’ve looked back and said, “Oh, I shouldn’t have done that to the patient”, or I think I’ve done the wrong thing, or you know. And I think, I suppose, if that’s me that would indicate, me trying to be deserving of trust I suppose, me trying to behave in a way that means that if I accept that I don’t know and I say that I don’t know, then that’s better than pretending that I do. But I don’t think trust is something that health professionals should seek. I think it’s something that should happen as a side effect of the way that you interpret and use evidence and try… and try and negotiate your way through clinical practice, as it were. You know, because, people who are trying to tell you to trust them, well you never want to trust them, do you? Absolutely. No, I mean I think that’s the thing that I’ve really noticed about your work. I’ve seen you do a couple of talks in the past and reading your BMJ work, I think it’s about openness and honesty. And that’s kind of something that I would love to see in more health professionals. That kind of attitude of, I don’t know the right answer, let’s work together on finding it and then make some shared decisions. All that stuff is quite scary, I think, you know, because you are essentially saying…it’s more than just saying you don’t know, it’s also you’re feeling a bit lost, you know. So much of people…so much of the suffering I think that people have when they get chronic conditions is the unknown; what the future might hold, you know. And I don’t have any great answers, I think, but a lot of the time what you’re saying to people is, I don’t know really how to help but I’m willing to be here, I’m willing to keep talking, I’m willing to do what I can, you know. And I say that, particularly with our amazing district nurses. And our district nurses are just incredible and they will go round and see people who have a life-limiting condition, who know they are probably going to die in the next while and they will go in and they will basically offer their…their professional abilities. And they will go in and a lot of the time they will just have conversations. They will just talk to people about stuff and through that they will find out what’s important. And I hate these lists of questions, these grand questions, about what’s important to you, blah blah blah, you know. Actually talking to people and getting to know them, you find all that important stuff out anyway as part of a natural relationship, rather than a condensed thing that’s got to be done really quickly and you’ve got to have your ideas and your expectations and everything pinned down and what you want and what you don’t want really fast. Instead, I think what…and I just admire our district nurses for this so much, because they just exemplify professional abilities and they are willing to go in and listen and hear and plan and make a commitment to see that person again, as frequently as needed. And that’s the kind of stuff, I think we should just cherish. And how do you prove that works? Where’s the evidence for that, you know? How do you show that that’s better than, you know, having a call centre where it’s a different person you speak to every time? And I think so much of general practice is about relationships. It is impossible to understate how important that I think that is. And it’s not just relationships between doctors and patients. It’s also between different groups of professionals. And it’s so much easier when it’s professionals that you know and you trust, you’ve worked with for years. Their coffee cup sits beside your coffee cup in the staff cupboard, where all the coffee cups are, and it’s so difficult and different when people are disenfranchised from each other. When people, you know, is it this person’s job or that person’s job, you know? That the sense of team is really important, you know? Denis Pereira Gray, who is a long retired GP, published a fantastic paper recently showing an association between longevity and continuity of care (https://bmjopen.bmj.com/content/8/6/e021161.full.pdf) and I worry that we become so transfixed on numbers from the Quality and Outcomes Framework for statin prescribing, for atrial fibrillation detection, that we’re missing something in plain sight, which is the value of relationships between people. Haven’t we already lost that? Particularly in the last 10 years? Isn’t that so much worse than it was ten years ago? My experience of trying to get an appointment with the same GP is it’s impossible. Yeah, yeah. I mean because they’re probably doing cholesterol and blood pressure testing in the under forties which Matt Hancock’s app has said must be tested immediately in that nonsensical heart age tool [laughs]. So the first book I wrote was called “The Patient Paradox” and that is the title, the paradoxical situation where you are made into a patient when it can’t really advantage you and yet when you need to be a patient, you don’t get the chance to be so. And the way to solve that should be through an evidence-based, equitable NHS. And I fear that so many conflicts of interest have crept in, that have taken us away from that ideal. And I think that we just need to uprise against that. We need to rebel against that. And, unfortunately, so many doctors that I know have just given up and went to Australia and New Zealand where they feel they can practise the kind of medicine they want to. And I am aware of some of my colleagues in huge distress, trying to provide good enough care to patients they look after and having that huge moral distress that comes because they feel as though they are not doing their best, they are not doing what they want to do. And I think that is so hard and so difficult and I can see how that erodes so much of what you want to do: your pride in your job, your morale, your feeling that you’re doing your best for patients. And I think everything crumbles, if you don’t have that. Good luck with the keynote tomorrow. I know it’s gonna go down really well at this event. And I’m sure it will go down really well on twitter, as well. I’m just going to rewrite it now. Perfect. Thank you. I’m glad I’ve inspired you [laughter]. Cheers. McCartney M. The Patient Paradox: why sexed up medicine is bad for your health. London: Pinter & Martin; 2012.